Last night, Mom wanted to go for a walk, but Dad wanted to watch TV, so Mom said that just the girls would go walk. So I put on my harness and leashed up Mom and off we went! One of the first things that happened on the walk is that we had the opportunity to be good neighbors. A couple streets over, on the corner, there is a house that has a dog. We know this because the dog barks at us through the fence. Yesterday, when we walked by, the gate to this house's backyard was wide open. We didn't see any of the people around, so we trespassed (ssh! Don't tell!) and shut the gate. Mom said she didn't want the dog to accidentally escape if the people didn't know the gate was open. I agreed. 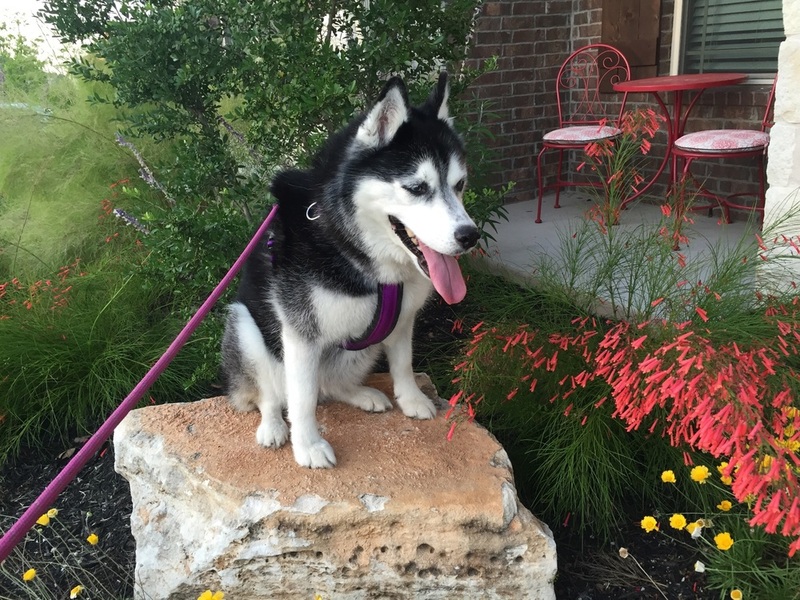 Finally, we got back home and I posed for a picture on our rock with Mom's flowers. I love walks with just Mom!